The new sensor design of Michell Instruments’ S8000 Remote chilled mirror hygrometer combines high-accuracy temperature control with new materials to improve reliability and avoid condensation. The relative humidity in climatic chambers will always deviate from the set point. Even in high precision chambers this deviation is typically between 1-3% RH, which can have a considerable effect on the results of many tests. 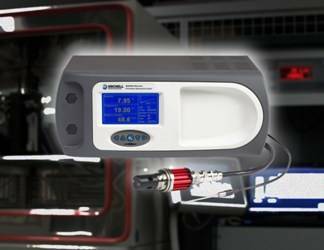 A calibrated reference instrument such as a chilled-mirror hygrometer reduces this uncertainty to just 0.5% RH, but can be difficult to install and bulky, reducing the amount of usable test space within the chamber. To overcome these space issues, Michell Instruments has introduced an innovative sensor design with the launch of their S8000 Remote chilled mirror hygrometer. The compact remote sensor head features an open cell design, removing the need for any complex heated sampling arrangements or an external pump. Installing the sensor is simply a matter of placing it in an appropriate position within the chamber, and routing the cable externally to the instrument. The improved design has an optional aluminium sensor head that provides a swift response to changes in temperature, preventing any risks of condensation occurring during rapid transitions between temperature set points. The field-proven sensor boasts upgraded temperature control for extremely accurate dew-point measurement, and, coupled with the standard ±0.1°C accuracy ambient temperature sensor, it provides fundamentally derived, high precision relative humidity readings necessary for validating the results of environmental tests. Outside of the chamber, the instrument operation is easy without user intervention. The S8000 Remote features a highly visible LCD display that shows any three user-selectable parameters (typically dew point, relative humidity and temperature) in large clear text. The display also features a stability graph and displays the operational status of the unit. A powerful and easy to use menu system enables the operating parameters of the instrument to be quickly customised to suit the target application. The instrument also comes with three customisable analogue outputs and one alarm, enabling integration into an existing automated test or calibration system.